Ships from Canada. Most customers receive within 2-10 days. *Recommendation is made based on PC configured with an Intel Core i7 3.2 GHz processor. Pre-built system may require less power depending on system configuration. **Graphics Card driver is not included in the box; GeForce Experience will download the latest GeForce driver from the Internet after install. This item is covered by OneDealOutlet Canada Return Policy. Pros: Quiet. Powerful. Only requires one 6 pin power cable. Will fit fine in most tower style cases. Cons: The two clear fan look great from the one side. Doesn't look great in back as no back plate. Doesn't look great from the top very simple design I would call boring. Other Thoughts: I bought this on sale from another retailer. At the time it was the best deal of all the dual fan 1060 3gb. I like that I can crank the fan speed to 85% and its still fairly quiet with great cooling in my stuffy case with poor airflow.. Doesn't seem to overclock very well I pushed it 100mhz past the already high 1830 boost clock and every once in a while had stability issue so dialed it back down. Possibly adjusting the voltage would solve it but I'm not a serious over clocker your millage may vary. People are afraid of the 3gb vram limit but I can honestly say has not been an issue for me. The only game I have that pushes usage up to 3gb at 1080p is Star Wars Battlefront 2 and for some reason still runs smooth +60 fps at Ultra settings. The most demanding game I have is Witcher 3 and with 1080p Ultra setting with hairworks turned off I get 50 fps with about 2.2 gb vram usage. Doom 2016 I'm getting 120fps. 1080p Ultra Vulkan. Great card if can find at a reasonable price. First PNY product I have owned for about 2 months now will repost if it fails later. Pros: -This card performs exactly as I'd hoped. Some complain the fan is flimsy...I like it considering it keeps the card much lighter and keeps pressure off the slot. -It runs very cool/quiet: I play Battlefield 1 on Ultra (1080p..looks gorgeous) it averages 80+ fps and rarely dips below 70fps in a heated battle; it runs GTA 5 on Ultra even better than BF1. I partnered this card with a Ryzen 5 1600x and the GCard hasn't gone above 73C and the processor hasn't gone over 55C under full load (I replaced stock thermal paste with Arctic Silver, and used Thermaltake Contac Silent 12 cooler). -550W power supply does the trick so card doesn't eat too much power. -Freaking love this card in my budget build!! Other Thoughts: This is an amazing card for the price. If you wan't to go above 1080p, I recommend the 1070 or 1080 version. 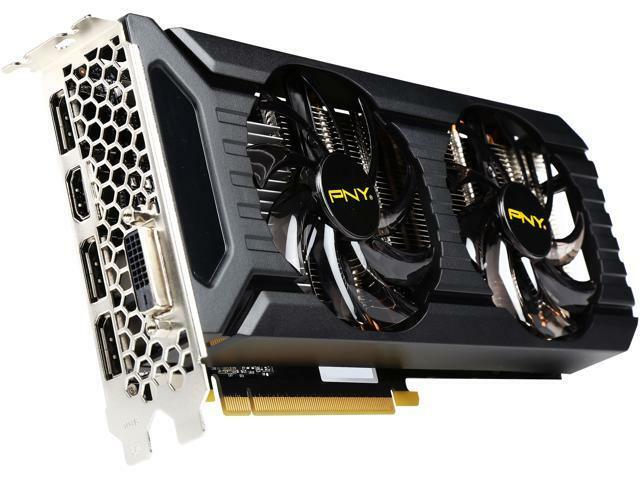 This is not the card for anything above 1080p. I did my homework before I built this custom rig. Can't stress enough how happy I was when I fired everything up and saw how much better BF1 looked (Compared to my older FX-8350 build). It was so good I had to come on and write a positive review. Thanks PNY for making another solid product. Will be buying PNY brand in the future! Pros: Plays everything my son wants it to with ease. Mileage will vary with each set up and game but it is worth the money. Great card. Other Thoughts: Solid card. I have 2 of these in the house and both are working like a charm. Pros: 1. Low power usage, it only recommends at least 400 watts. 2. Only needs 1 x 6 pin power connector. 3. It is very quiet. 4. The cooling design for this works very well. 2. Can pretty much play any game at 1920x1080 resolution with all settings set to max with good fps. Other Thoughts: If you want to game at 2k or 4k you will need the 1070 or 1080, unless it is not a very demanding game. - Provided a great improvement from my old GPU while it lasted. Cons: - Failed after a month and a half, started throwing up artifacts and causing crashes. Other Thoughts: This GPU was excellent for me up until about a month and a half after I put it in my system. About a month in, it would start throwing up occasional artifacts and shutting off at random. Usually I could work with it and continue playing whatever I was playing, or watching whatever I was watching. However, these incidents just became more and more frequent until it just wouldn't come back at all. I did alot of troubleshooting and searching for why this might happen, tried quite a few solutions that were offered to me. Nothing worked. Finally, I did troubleshooting on the hardware in my case and cleaned everything top to bottom to ensure there could be no heat issues. Still the same result. So then I yanked out this card [which was supposed to be an upgrade from my old ASUS 7870] and I popped in that same old ASUS 7870. Everything was fine again. Cannot recommend this card and I will not be purchasing any PNY products in the future. Failed after a month and a half, while my ASUS card has been running strong since 2013. Will upgrade soon but certainly I will not be buying a PNY card for my next upgrade, nor anything else they sell. Please contact our dedicated support at championfocus@pny.com and reference number 661070 so we can further review the situation and determine an appropriate solution. Pros: Great price! Picked this up for $185! Very power efficient with only a 6 pin connector and 120W TDP. I can easily run the games I play on high/ultra settings at 1080p. Lifetime warranty! Cons: Fans get loud at higher RPMs, but not terrible. It runs warm, but I haven't seen it throttle. No backplate or LED, but at this price I didn't expect that anyway. Other Thoughts: Not sure where the last review complained about the lack of overclocking. Mine is stable at 2000 on the core (boost) and 8400 on the memory (Hynix). I created a custom fan curve to ramp the fans up a little earlier, and it starts around 73 degrees while stress testing. Is it as pretty as an MSI Gaming X or Asus Strix? No, but there's no extra money required for similar performance. - Runs hot, even tiny bit load, the temps goes above 65 C. However the fans at full speed does not dissipate the heat. Other Thoughts: - Dont ever buy this, if you did so, then it cant be even used as a paper weight cos this card is so light. - spend another 30 or 40$ and get the EVGA or MSI 6GB. Please contact our dedicated support hotline at 888-316-1194 or e-mail us at championfocus@pny.com so we can further review the situation and determine an appropriate solution.